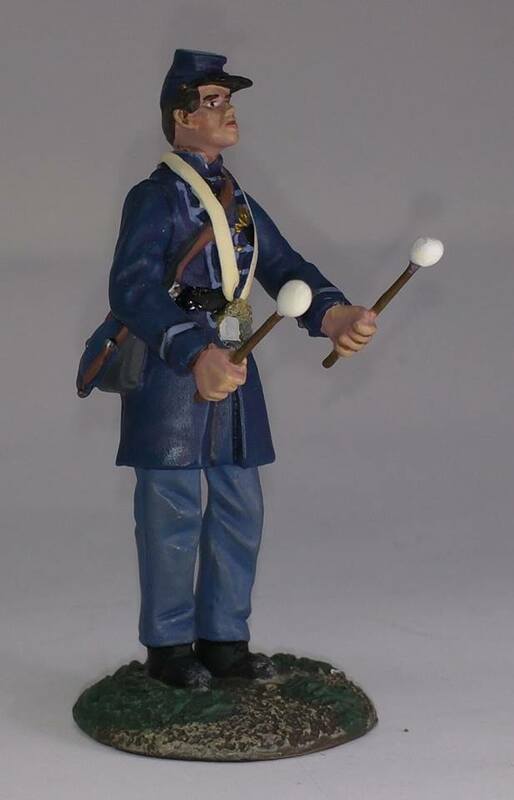 All too often overlooked in the canon of American Civil War history are the courageous maraca players of the Army of the Potomac. This new product from Toy Soldiers Forever! finally gives these gallant men their due. Issued only in 1999 this trio of Hoosiers charged into my mailbox last week from their barracks at Crown Military Miniatures. These are needed reinforcements to my ever-growing W. Britain Iron Brigade. These little pewter men are blissfully unaware that they are headed for a 54mm cornfield at Antietam on September 17, 1862...but that's the grist for a future post. The Hardee hat at top is from 1999, and the one below is from an Iron Brigade drummer produced in 2014 (#31235). Note the subtle differences in detail. The blue infantry cord as well as the hunting horn are rather sloppily painted, where the same on the more recent hat are more meticulously applied and even shaded. Another nice detail is the company letter on the corps badge. Here's a nice piece of detail; note the slits cut in the flap of the cartridge box to affix a missing brass "US" plate. As was frequently the case these plates went missing or weren't installed in the first place. A tip of the TSF kepi to the sculptor of this piece. Also of note in this closeup is the crude shading technique of these earlier Britains. There is no subtlety or gradiation of shading that you find on figures of later generations; instead a darker color is quickly brushed into the fold.